Yes the idea. Where as they patented the application for vr. But yes it will be interesting to see how it plays out. 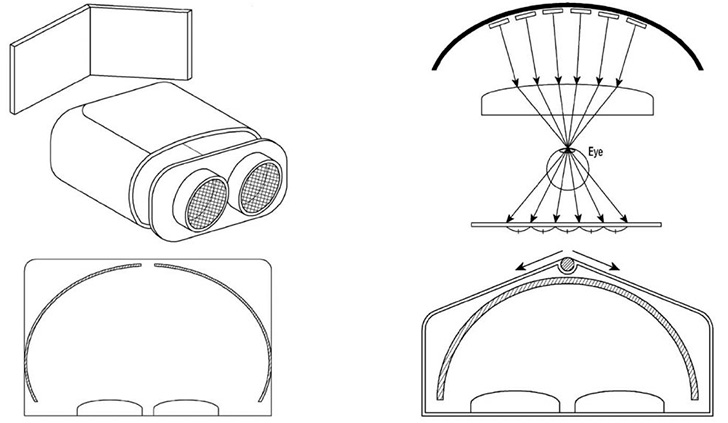 Oculus have filed a patent for a new type of curved display for VR headsets. Are you serious?! How is that even fair? Indeed. Was not amused to see them do it. Now if you check out the Dev from the Berlin meet he does say that Curved displays will create rendering challenges. The patent from Samsung can be seen here, in Korean . But as @geoffvader said it was in the public domain before, I hope we can see more curved headsets than the ones from oculus and samsung, or just make a better/different patent. True but patent wars cost money & both companies are likely to ensure it’s not easy. True but I’m sure they have that in the works for their half dome. Either way sneaky & underhanded. They might as well do thIs. Basically two ping pong balls cut in half with curved microled displays. That’s a nice design and render, does the HMD flip up? While everybody else is trying to miniaturize tech and use weight saving alternatives (e.g. Fresnel lenses) I think that weight and comfort are always going to fight each other and delay advancement. So one concept I have always thought about is something like a lightweight full size motorcycle helmet to solve the even-weight distribution and where the visor is would just be the panels which can slide up leaving an open gap, just like a normal helmet. And to take it a leap forwards, it could be something a future augmented soldier would use with a built in computer, motion detection alerts, night vision, full heads-up-display, armor plated, comm linked, binocular vision etc etc. That would be interesting. It should be well ventilated though. Does that mean that you got yours?!!! Edit: I can’t figure out if you got yours and modified your quick start guide or if you pulled that out of your arse? Either way I like it, but I’m hoping that you finally got your Pimax!